Ben Cherington (far left) has already shaken up the Red Sox’ pitching staff and brought in Pablo Sandoval (second from left) and Hanley Ramirez. 1. Alex Rodriguez returns — After serving a 162-game suspension for his role in the Biogenesis scandal, Rodriguez faces a daunting task of returning to baseball at age 39 with two degenerating hips. He’s not giving up the $60 million-plus owed him. Rodriguez faces tremendous scrutiny from the public and his own team, which by all accounts wishes he would go away. Spring training in Tampa should be a virtual zoo, and while the Yankees have traditionally been built to withstand such distraction, this should be a whopper. Best-case scenarios are that he can’t hold up physically (though most of his time will be spent as a DH) or that Major League Baseball and/or the Yankees come up with more damaging material to keep him out of baseball for good. If Rodriguez shows he can still play, there’s also the issue of incentives he could reach. He’s only six homers shy of 660, which would trigger a $6 million bonus to go along with his $21 million salary for 2015. When baseball announces its Hall of Fame class for 2015 on Tuesday, pitchers Randy Johnson and Pedro Martinez are near locks to take their places among the game’s greats. How their career ranks in key pitching statistics will compare to the best in Cooperstown. 2. Rob Manfred replaces Bud Selig as commissioner — This should be a seamless transition as Manfred has been a force in, among other things, labor negotiations and the steroid policy. Manfred must now show his more public side, which is inherent to the job and which Selig exhibited so well for more than two decades. Manfred also will have to begin dealing with negotiations on a new basic agreement. He will also oversee changes in the game and efforts to improve pace of play and marketing the game to a younger generation. 3. Giancarlo Stanton and Mike Trout — The new faces in major league baseball? Stanton will have $325 million worth of attention focused on him. Given his performance last season (37 home runs and 105 RBIs) and now a paycheck to match, Stanton will return to the field after an ugly beaning in September from Brewers righthander Mike Fiers. Nobody will know if there are any lingering effects until we see how comfortable Stanton is in the batter’s box against a righthanded pitcher. Trout, 23, has had the top WAR in baseball the last three seasons, including 8.7 in 2014. He hit 36 homers and drove in 111 runs last season, is a top defender, and is considered the most exciting player in baseball. 4. Chicago Cubs — Any team that has gone without a championship since 1908 will be watched particularly closely now that they are moving closer to competing in the National League Central, spending $155 million to sign Jon Lester as a free agent and the possibility they’re not through revamping their starting rotation (also signing Jason Hammel). President of baseball operations Theo Epstein has said the rebuilding process will be completed in the next couple of years as his talented young hitters mature. 5. San Franciso Giants — The defending World Series champions have won three championships in the last five seasons. There’s dynasty talk in the Bay Area, and rightly so, but can the Giants break the string of every other year and repeat? All eyes will be focused on World Series hero Madison Bumgarner and whether his innings overload catches up to him in 2015. 6. Boston Red Sox — Last to first to last. Really? How can this happen? And will the 2015 Red Sox rebound for another first-place finish? This will be an interesting study. General manager Ben Cherington has proven he can do the last-to-first thing. After the 2012 debacle, he signed seven ideal free agents and transformed the Red Sox from 69 wins to 97 in 2013, winning the World Series. He must now take a 71-win team and perform a similar miracle. Cherington revamped the pitching staff, subtracting Lester, John Lackey, Jake Peavy, and Felix Doubront, and adding Rick Porcello, Wade Miley, and Justin Masterson, getting considerably younger. 7. Offense — The use of defensive shifting, which is becoming as boring as watching the pitcher hit, has done a number on lefthanded-hitting sluggers such as David Ortiz, limiting the opportunity for these hitters to do damage. It’s something MLB needs to look into and possibly impose some restrictions. Teams averaged 4.07 runs per game in 2014, the lowest mark since 1981. 8. Pete Rose — Selig protected the integrity of the game by not allowing Rose, who gambled on baseball, back into the game. He stuck to his guns. But Rose feels there’s hope with a new sheriff in Manfred. The all-time hits leader, Rose will argue that his playing career was clean and that he only bet on baseball during his managerial years. 9. Kris Bryant — In an era lacking power, Bryant, who turned 23 on Sunday, is baseball’s hope for a pure slugger to emerge. Are we putting too much pressure on the 6-foot-5-inch, 220-pound Cubs third baseman? Bryant hit 43 homers in the minors last season. There’s no reason to believe he won’t be with the big club in 2015. And then we’ll begin to see whether the next 35-50-homer slugger is born. Only one player — Nelson Cruz of the Orioles — reached 40 homers last season. In 1996, there were 17. In 2006, there were 11. It has spiraled downward since. 10. Clayton Kershaw — The best pitcher in baseball? Kershaw, a career 98-49 with a 2.48 ERA, and 21-3 with a 1.77 ERA last season, has proven to be that since he entered the league seven years ago. But the 2014 National League Cy Young Award winner and MVP had a poor postseason (7.82 ERA in two starts), somewhat puncturing his seal of invincibility. We’ve given you the Dan Uggla story in bits and pieces the past few weeks. Here’s the rest of it. Uggla was hit twice in the head by pitches, in June 2012 and in spring training 2013. His career went downhill fast after the first beaning, and Uggla never recovered. He was released by the Braves in early 2014 and was paid the more than $18 million remaining on his contract. Dejected about how fast his career declined, Uggla had no answers. That’s when old friend Marquis Grissom called him last September and told him he knew the problem. Grissom was hit in the head during his career and suffered a similar decline. He hooked up Uggla with Las Vegas orthopedist Robert Donatelli. Donatelli and his staff put Uggla through a series of tests and determined he had suffered oculomotor dysfunction. Uggla, who had gone so far as to get Lasik treatment because he wasn’t seeing the rotation of the ball, had 20/15 vision. But the testing found that when Uggla moved his head or body, his vision was 20/100. This explained being unable to see the rotation of the ball. It also affected him in the field, Uggla saying it got to the point where he didn’t want the ball hit to him at second base. Uggla was given two weeks of exercises to improve the condition. And in November, Donatelli declared him healthy, his motion vision back to normal. The 34-year-old Uggla, who once hit 30 or more homers for five straight seasons, was signed to a minor league deal by the Nationals, who will invite him to spring training. The Orioles and Rangers were also interested, but Uggla had a relationship with Washington GM Mike Rizzo and decided it was the best opportunity for him. The Nationals were familiar with the condition, having gone through it with center fielder Denard Span, though his dropoff in 2013 wasn’t quite so severe. Unless the Nationals acquire a second baseman, they will go into spring training with Uggla getting a great chance to win the job against Danny Espinosa. 1. Does Jackie Bradley Jr. remain in the majors as a reserve outfielder/defensive replacement? The only Red Sox starter he would replace is left fielder Hanley Ramirez, as Rusney Castillo and Mookie Betts likely would remain in most games. If Allen Craig is in the lineup (providing he’s still with the team), Bradley could replace him. And then there’s Shane Victorino, who is not coming out for defense. 2. What a full life Bill Kearns led as an adviser/scout for so many years (with the Mariners most recently). The Milton native even offered advice to GM Jack Zduriencik a few days before he died peacefully in his sleep Wednesday at age 94. Kearns was a legendary basketball coach at Weymouth High and one of the classiest people you could ever meet. He was a role model for young scouts and for all of us involved in baseball. 3. My only question about the Hall of Fame announcement this week is whether three or four players are elected. Pedro Martinez and Randy Johnson seem to be locks, and then there’s Craig Biggio, who finished two votes short in 2014, and John Smoltz, on the ballot for the first time, who was successful at starting and closing. 4. Interesting that both Hiroki Kuroda and Daisuke Matsuzaka decided to return to Japan to finish their careers. Kuroda could have continued to make a nice wage with the Yankees, Padres, or another team that would have been interested on a one-year basis. Different story with Matsuzaka, whose time was pretty much up in the US. Kuroda was still viable, but he wanted to end his career where he began it. 5. OK, he has built the reputation of being a pain, but seriously, why would a team not trade for Jonathan Papelbon? He saved 39 games and blew only four for a bad team in 2014. In the last three years, he saved 106 games in Philadelphia. While his velocity may be down from his Boston years when it was 95-96 miles per hour, Papelbon has found a way to keep getting people out. He’ll earn $13 million this season and has an easy vesting option for $13 million in 2016 if he finishes 55 games. 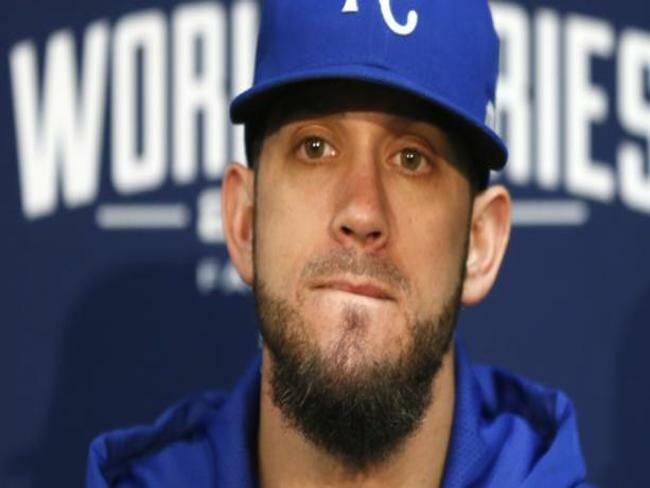 Pitcher James Shields remains available on the free-agent market. 1. James Shields, RHP, free agent — It hasn’t been easy to determine Shields’s market. Jon Lester’s negotiations were so public, yet Shields’s have been private. Still, the teams who have had discussions or shown interest, according to a major league source, are the Red Sox, Cubs, Angels, Dodgers, Rangers, Blue Jays, and Giants. The Giants have veered off a bit after signing Jake Peavy but remain open-minded. The Cubs obviously have the Joe Maddon respect factor with Shields from their days together in Tampa Bay. 2. Nori Aoki, RF, free agent — Aoki was seeking a three-year deal, and while it’s still a possibility, conversations with teams have centered mostly around a two-year deal. The Orioles have definite interest in Aoki as a replacement for Nick Markakis, who signed a four-year deal with the Braves. Aoki also has some appeal to the Giants. 3. Ben Zobrist, 2B/RF, Rays — Zobrist, 33, has one of the biggest trade markets out there. The super utilityman is being pursued seriously by the Giants, Nationals, Angels, and Cubs. The Rays recently acquired Asdrubal Cabrera on a one-year deal, sparking further speculation that Zobrist might be on the move. The Rays are said to be asking for at least one top prospect and a mid-level one. 4. Dayan Viciedo, OF, White Sox — With so many outfielders still available in trade and free agency, the White Sox have garnered interest in Viciedo but have had a difficult time moving him. The righthanded hitter, who twice has hit more than 20 homers, hasn’t emerged like some of the other Cuban hitters, though he will be only 26 when he plays in 2015. He doesn’t particularly crush lefthanded pitchers, which would have made him a platoon candidate. Scouts are torn as to whether he emerges as a viable righthanded power hitter, but he may be worth the gamble. 5. Henry Owens, LHP, Red Sox — Boston’s top pitching prospect has been been asked for a good amount of times by opposing teams this offseason. Owens will wind up spending the year at Pawtucket, unless there’s a major injury to one of the starting five. The Red Sox did weed out Rubby De La Rosa and Allen Webster in the Wade Miley deal, and are left with a Pawtucket rotation of Owens, Brian Johnson, Matt Barnes, Anthony Ranaudo, and possibly Brandon Workman if he’s not used out of the bullpen with the big club. 7. Dylan Bundy, RHP, Orioles — After undergoing Tommy John surgery, the prospect will start 2015 at Double A Bowie, according to Duquette. The Orioles do not need to rush Bundy, whom they still believe could be a top-of-the-rotation starter. 8. Yoan Moncada, INF, Cuba — Moncada is the most sought-after Cuban infielder and he’ll soon be clear to join a major league team. Moncada, 19, has drawn considerable interest, but teams like the Red Sox and Yankees who are well over their international pool allotment, have until until July 1 to sign him. Moncada is a second baseman and possibly a third baseman. From the Bill Chuck files — “From 2005-14, CC Sabathia was the winningest pitcher with 154 victories. From 1995-2004, Greg Maddux was the winningest pitcher with 174 victories.” . . . Happy birthday on Monday to Jose Iglesias (25) and Chris Nabholz (48). An earlier version of this story included an incorrect date that Cuban infielder Yoan Moncada could be signed by the Red Sox.